I have a special guest today. Dianne is a great friend from a wonderful dachshund maillist. Momma and I have known her for years. She visited before to talk about Lili Marie and Miguel Luis. Today she has returned to remember sweet Lili. 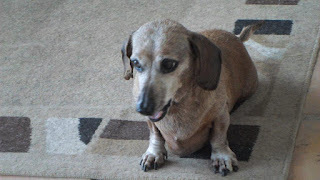 Dianne: My sweet Lili Marie, a red smooth dachshund who was born on March 1, 2000 and went to the Rainbow Bridge on January 3, 2017. Abby: What are some happy memories of your Lili Marie? Dianne: Lili made me happy all the time. She was the sweetest dog but also a diva and it was clear she ruled the household. Her brother Miguel Luis (black and tan standard dachshund) deferred to her in all things, as did I. She always made me smile. Dianne: She loved to dress up in her variety of girlie harnesses. It was clear she loved pink (I tried to pass off a purple coat once, didn’t work) and when she got a new harness she would pose and strut around like she was modeling it. I hated to see her arthritis advance to where I knew she was in pain most of the time. 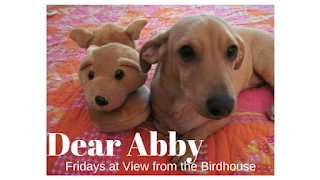 Abby: I enjoyed visiting with you today. Is there anything else about your Lili you would like to share? Dianne: Lili gave me almost 17 years of love, joy and devotion and finally it was time to let her go. I miss her so much. Abby: Dianne, thank you so much for visiting and sharing memories of Lili Marie here today. 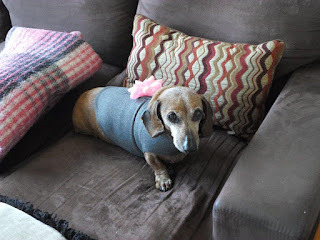 She was a very special girl, and Momma and I loved hearing about her over the years in our online dachshund community. Friends, you can leave messages for Dianne in the "comments" section below. If you would like to visit and remember a special pet, please let me know, and also include your email. What a sweet pet lili marie sounds like! I sent this to my dad he just lost a pet! It sounds like she was a wonderful and sweet member of your family. I don't have any pets, but a friend of mine has 3 dachshunds. What a lovely memory of such a sweet little girl. Thank you for sharing her with us, Dianne. And thank you to you Abby for inviting us to talk about our very special and much missed pet families. I can just picture that precious little girl, in her pretty new harnesses, letting everyone know exactly who was in charge! Such a cute little puppy. My mom had a puppy that looked just like that one but he got sick and died. Thank you so much for visiting. Dianne, a special thanks to you for sharing Lili's story here! Wow - almost 17 years old! That's a lot of love and friendship she's been giving people! So sorry to hear the passing of her sweet Lili Marie. I'm sure that she was a sweetheart and will be missed dearly. Thank you friends! I really appreciate your wonderful comments. What a sweet dog! Sorry for your loss! Thank you for visiting! When Dianne visits the blog I am sure she will find comfort in your kind words. Nadine, I agree, and that is a lovely thought.